In the winter of 2012/13, the Haus der Kunst in Munich – one of Europe’s most important museums for contemporary art – hosted the exhibition ECM – A Cultural Archaeology. The goal of curators Okwui Enwezor and Markus Müller was to show the range of the label’s artistic endeavours in music, graphic art, and photography and its creative interchanges with film, theatre and literature. For this exhibition, Manfred Eicher and Steve Lake created this box-set accentuating directions in ECM’s rich musical history. Many themes and streams are touched upon here including the range of composition in the New Series, music for and from films, imaginative historical reconstructions, trans-cultural music, ambient minimalism, and jazz and improvisation of many hues, in a collection with a playing time of more than seven hours.With Heiner Goebbels, Steve Reich, Arvo Pärt, Gidon Kremer and Keith Jarrett, György Kurtág, Tigran Mansurian, Rosamunde Quartett, Betty Olivero, Kim Kashkashian, Meredith Monk, Giya Kancheli, Keller Quartett, Hilliard Ensemble, Valentin Silvestrov, Eleni Karaindrou, Jan Garbarek, Jon Balke and Amina Alaoui, Rolf Lislevand, Nils Petter Molvær, Eivind Aarset, Stefano Battaglia, Tord Gustavsen, Egberto Gismonti, Norma Winstone, Ralph Alessi, Anja Lechner, Vassilis Tsabropoulos, Colin Vallon, Christian Wallumrød, Tomasz Stanko, Jimmy Giuffre, Paul Bley, Evan Parker, Barre Phillips, Robin Williamson, Old & New Dreams, Sinikka Langeland, Frode Haltli, Gary Peacock, Steve Kuhn, Wadada Leo Smith and many others. Vossa Jazz’s final day started early (11:30am) and ended early (10:30pm, leaving plenty of time to hit the overnight train to Oslo, the first leg of a long trip back home to Canada), but amongst a number of these fine shows, two must-sees stood out. Sinikka Langeland has been on the Norwegian scene for many years, releasing a number of fine recordings in Norway, based on either folk or classical traditions; but it was with the release of the sublime Starflowers (ECM, 2007) that she finally showed up on the international radar. The singer and kantele player—a plucked member of the dulcimer/zither family—has been exploring the music of Norway dating back to mediaeval times through to Norwegian folk hymns and Bach chorales since Langt Innpå Skoga (Grappa, 1994),but it was with Runoja (Heilo/Grappa, 2002) that, with the recruitment of trumpeter Arve Henriksen, she began to form the group that would eventually coalesce with Starflowers and continue with The Land That Is Not (ECM, 2011), an ensemble also featuring saxophonist Trygve Seim, bassist Anders Jormin and drummer Markky Ounaskari. Henriksen was not available for Langeland’s Sunday afternoon performance at Osasalen, another venue situated a short five-minute walk from the Park Hotel, but while it would be difficult to ever say the trumpeter’s presence wasn’t missed, the remaining quartet certainly sounded no less complete without him; the only thing the group missed, during its early afternoon show, was the inevitable interaction between Henriksen and Seim, but in a show that drew heavily from her two ECM group recordings, the saxophonist simply assumed a more central role. Still, as a player whose interest in improvisation is one that eschews meaningless demonstrations of virtuosity—and as one of Norway’s most important composers to emerge post-Balke on albums like Different Rivers (ECM, 2001) and Sangam (ECM, 2005)—Seim played with characteristic restraint, his tone on tenor and curved soprano as inimitable as ever, his curious ability to bend notes and play microtonally the result of significant time spent studying in the Middle East, and his strength in evoking melodies redolent of his country’s tradition as unmistakable as always. Jormin—perhaps better known for past tenures with American saxophonist Charles Lloyd and Polish trumpeter Tomasz Stańko, and his ongoing partnership in pianist Bobo Stenson‘s trio—may have been at a disadvantage, with his bass lost in transit and performing on a borrowed instrument, but if he was working any harder to achieve his characteristic singing tone, nobody could have noticed. Ounasakari—who has certainly been getting around since he recorded >Kuára: Psalms and Folk Songs, also appearing in the Fugara (DNL, 2012) quartet, with pianistStevko Busch, trumpeter Markus Stockhausen and saxophonist Paul Van Kemenade and, earlier in the naughties, Brutto Gusto (Challenge, 2003), with Dutch trumpeter Eric Vloeimans—was his characteristically sensitive self; capable of delicately moving the pulse forward with the gentlest of cymbal work but equally able to imbue the music with more power and drive when required. But as superb as the entire group was, it was hard pull attention away from Langeland. Her playing on the kantele was a revelation; her singing a perfect combination of vulnerability and effortless power. The kantele is a much broader instrument, when it comes to range, than it might appear in photos, and Langeland’s mastery of the instrument was even more impressive live than her recorded performances suggest. Combined with Jormin’s soaring tone, Ounaskari’s textural intuition and Seim’s unfailingly perfect choices, it made for an afternoon performance evocative of sweeping images of barren landscapes and almost painful beauty—one that will not soon be forgotten. Sinikka Langeland is invited to join the KALEVALASEURA ( The Kalevala Society). The Society has 326 Finnish and 124 foreign members. All of the members have contributed to the understanding of folk traditions, national scholarchip, the arts, or the promoted knowledge of Kalevala. Den profilerte folkemusikeren Sinikka Langeland bidro med tekster og musikk fra de dype østnorske skoger i den høyst vestnorske jazzfestvalen på Voss i helga. Med toppmusikere som Trygve Seim,. Anders Jormin og Markku Ounaskari på lag serverte Langeland blant annet Hans Børlis tekster for et stort og engsasjert publikum. Sinikka Langeland spiller det spesielle instrumentet kantele og med godt akkompanement fra noen av nordens fremste jazzutøvere ble det en flott konsert på 40-årsjubilant Vossajazz sin siste dag. Norska söngkonan, kantele-leikarinn og höfundurinn Sinikka Langeland er í brennidepli þáttarins, en hún hefur getrið sér gott orð á undanförnum tveimur áratugum, ekki aðeins á sviði vísna- og þjóðlagatónlistar, heldur einnig fyrir skapandi samstarf við tónlistarflytjendur á öðrum vettvangi. Kvifor dyrkar ein folkemusikken til andre land, mens vi ikkje lyttar til vår eigen? Øystein Greni trur det er fordi vi vil flykte frå oss sjølv. Det sa han då Folkelarm samla Greni og to av dei nye, musikalske vennene hans – folkemusikarane Tuva Livsdatter Syvertsen og Sinikka Langeland, til paneldebatt under byLarm, med tittelen: «Kvifor hatar vi vår eigen folkemusikk?». Amerikanske Boyd flytta til London på 60-talet og blei fascinert av korleis britane trykte amerikansk folkemusikk – som blues – til sitt bryst, mens dei hata sin eigen. Valkyrien Allstars-medlem Erik Sollid, mens Tuva fungerte som rådgivar og inspirator. Etter sjølv å ha funne sansen for folkemusikk, trur Greni at folk treng å høyre musikken og få han presentert – for at det skal nå fram. – Valkyrien tek tilbake det folkemusikken kan ha vore, det rå og eigenarta – dåtidas rock’ n’ roll, der det blei sagt at dei måtte binde halm rundt beina på spelemennene fordi dei trampa så hardt at ein knapt kunne høyre noko anna. Og kanskje må også rockemusikarane vere frekke og hente ut det som er ein del av den musikalske arven til oss alle, uavhengig av kva folkemusikarane synest? For Langeland trur det ligg mye god musikalsk inspirasjon i folkemusikken, som har overlevd gjennom mange generasjonar, i hundrevis av år. Greni sjølv medgir at blant dei beste Bigbang-låtane er det kanskje songane med dei mest hardingfeleaktige gitarklangane som står seg best, som «Wild Bird», «To the Mountains» og «Isabel». Tuva meiner det manglar ein link mellom folkemusikken og resten av Musikk-Noreg. Valkyrien klarer å gjere «den gamle, kjipe folkemusikken» så bra og opprocka. Men eg opplever også som avgrensande at det er folkemusikk, sa ho på seminaret. – Det skal vi endre på! sa ein entusiastisk Øystein Greni, som samlar fansen i Oslo Spektrum i april for å feire «The Oslo Bowl» (©NPK). They will play from the albums «Starflowers» and » The Land That Is Not». 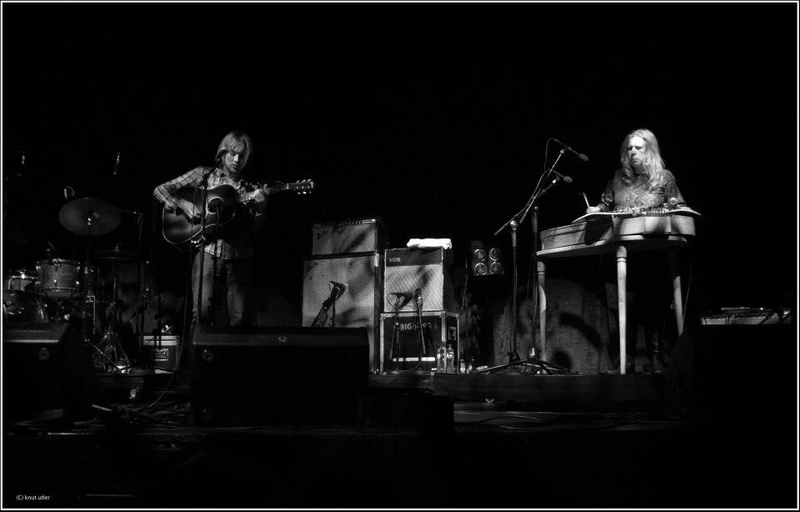 FOLKELARM / BY:LARM: Why do we hate our own folkmusic? 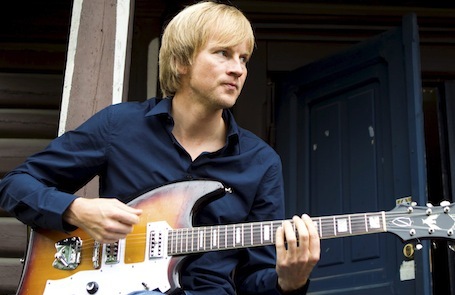 Øystein Greni and his band Bigbang is inspired by norwegian folkmusic on his last album and has involved among others kanteleplayer Sinikka Langeland. On the festival By: Larm you can meet fiddelplayer Tuva Syvertsen interviewing Sinikka Langeland and Øystein Greni about the project and about using traditional music in popular music. The trio has been in Rainbow Studio with producer Manfred Eicher and now I look foward to mix the the new music. We also had Trygve Seim as a guest. It sounded very good and special with viola and saxophone together. Next concert is in Oslo April 10. Riksscenen 20.00. 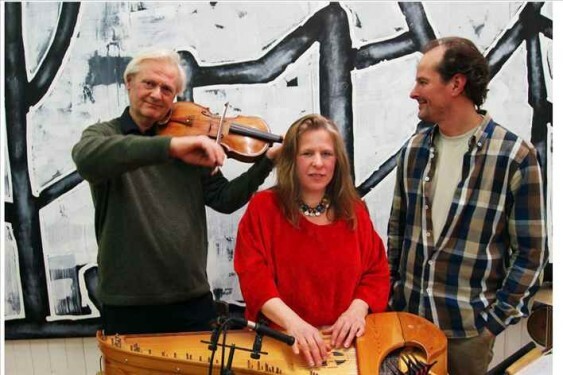 Trio concert in Kongsvinger, Rolighed, SØNDAG 27.JANUAR KL.18.00. We celebrated the new year with some intensive days working with the music for our first trio recording. Irma Salo Jægers atelier Lilleborg has a wonderful acoustic and the last evening we hold a houseconcert for friends, painters, writers, musicians and other music-lovers. Irma said she was happy that her paintings could hear some music, and we were indeed happy to play surrounded by her powerful art. Thank you Irma and to all of you who came to the atelier sharing a glass of wine with us and listening. Recording a new release in the end of January with Lars Anders Tomter and Markku Ounaskari as Sinikka Langeland Trio. Bigbang slipper 1. mars platen The Oslo Bowl som er spilt inn i Øystein Grenis studio i Los Angeles. Og første låt ut fra albumet har også en amerikansk klang i tittelen “Like Americans Do”. Sangen beskriver i følge bandet en frossen og tvilende nordmanns undring og misunnelse overfor amerikaneres pågangsmot og tro på seg selv. Samtidig som samme nordmann også vet at selve grunnmuren i USA og “the american dream” er i ferd med å sprekke. På “Like Americans Do” gjester Sinikka Langelandpå kantele (strengeinstrument mye brukt i finsk folkemusikk) og Erik Sollid fra Valkyrien Allstars på hardingfele, og Bigbang ymter frempå at nordiske folketoner vil blusse opp på det kommende albumet. “I took part in an exercise once. I was one of a group that went to the forest with an ecologist. The ecologist asked us to think about how we could earn money from the forest if we were entrepreneurs. Then we were to think about nature as our point of departure. It was very clear that our attitudes towards the forest changed according to our point of view,” says Sinikka Langeland. We are driving from Kongsvinger towards the centre of Finnskogen, a forested area in Norway where Finnish immigrants settled in the 1500s and 1600s. We talk about the forest, but also about the metropolis of Los Angeles, where Sinikka has just been working with the band Big Bang and the group’s front figure Øystein Greni. “I found a skateboard kantele that I just had to bring home with me,” she explains enthusiastically, before mentioning in passing that she lived in the USA for a half-year when she was younger, working as a folksinger and guitarist in the Norwegian village at Disney World. Oslo Philharmonic Orchestra at the Oslo Concert Hall on 1 November 2012. Sinikka Langeland (b. 1961) is closely connected with the Skogfinn culture in Norway. respect for the culture and traditions of the Skogfinn community in Norway.